Almost every animal carries a symbolic meaning for humans – in the case of the kangaroo it is that of peculiarity and strangeness, a reputation that throughout history has led to a troubled relationship between mankind and marsupial. Written in a lively and approachable style, Kangaroo relates the story of this odd, yet much-loved creature in Australian and global history, with a particular focus on how the image of the kangaroo has been used and abused. As well as describing the physiology and lifecycle of this unique animal, John Simons outlines the kangaroo in indigenous Australian culture. He looks at the fate of the kangaroo on first contact with Europeans, and considers the wider kangaroo diaspora, including zoo animals and wild populations across Japan and the USA. Kangaroo also explores the connections between visual representation, cultural meaning, and the current controversy in Australia surrounding kangaroo hunting and eating. 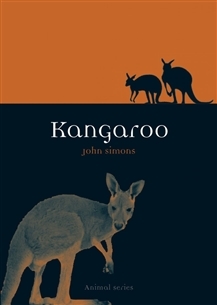 Simons demonstrates how the diversity of the kangaroo has frequently been reduced to a single stereotype, and how such misrepresentations now threaten the future of the species. Kangaroo will engage all kangaroo lovers, as well as those concerned with animal welfare and conservation, particularly in Australia.